Neglected cervical spine trauma is rare with very few case series reported in literature. There are no clear guidelines for its treatment. If operative treatment is sought, the role of skull traction, type of approach (anterior only, posterior only, or combined), sequence of surgery, type of instrumentation, etc., have to be considered. Hence, the treatment is challenging. Autostabilization has been described in the natural history of degenerative lumbar spondylolisthesis. As a result, many patients are treated nonoperatively, obviating need of surgery. 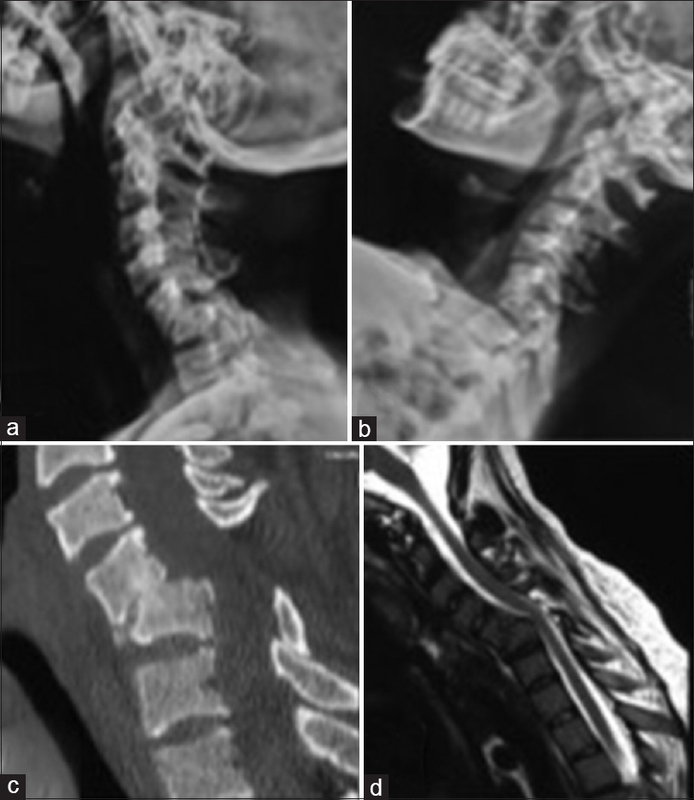 We report two cases of neglected/untreated fracture–dislocation at subaxial cervical spine. They presented with exertional neck pain. Computed tomography scan showed bony fusion at involved level. The patient was treated nonsurgically with favorable outcome at long-term follow-up. Our cases depict autostabilization in a case of neglected traumatic cervical spine injury, which is never been reported. Such patients do well with nonsurgical treatment, thus obviating need for extensive deformity correction. Neglected cervical spine trauma is rare with very few case series reported in literature. There are no clear guidelines for its treatment. If operative treatment is sought, the role of skull traction, type of approach (anterior only, posterior only or combined), sequence of surgery, type of instrumentation, etc., have to be considered. Hence, the treatment is challenging. Autostabilization has been described in the natural history degenerative lumbar spondylolisthesis. As a result, many patients are treated nonoperatively, obviating the need of surgery. We report two cases of autostabilization in neglected traumatic cervical spine injury and its fate at longer follow-up which has never been reported. A 31-year-old female presented with exertional axial neck pain for 6 months. There was no radiculopathy and neck range of movements was full and pain-free. There was no sensory-motor deficit. The patient had a history fall from staircase at home 3 years back, followed which she had neck pain. She took rest for 6 weeks with symptomatic treatment and collar support. The pain gradually subsided and the patient started doing routine activities. We investigated her by doing radiographs, which showed old fracture–dislocation at C5–C6 level. Dynamic radiograph was done to check for instability, which showed no movement [Figure 1]a and [Figure 1]b. Computed tomography (CT) scan showed bony fusion between the vertebrae [Figure 1]c. Magnetic resonance imaging (MRI) scan did not show significant cord compression or myelomalacia changes [Figure 1]d. Since the patient had no neurological compression on MRI and no demonstrable instability on dynamic X-rays, it was decided to give a trial of nonoperative treatment. There was a contention regarding future increment in kyphosis in the future; however, since there was autostabilization on CT scan, it was decided to avoid any operative intervention. The patient improved symptomatically with physiotherapy. Visual analog scale (VAS) and Oswestry disability index scored improved at the subsequent follow-up. A 30-year-old female presented to the clinic with a history of mechanical neck pain for a duration of 4 months. The patient had a history of whiplash injury in road traffic accident 5 years back. Following which, she used symptomatic treatment and collar support for 5 weeks. The pain gradually subsided and she started routine activities. Currently, pain was nonradicular with no signs of myelopathy. Neurological examination was normal. On MRI [Figure 2]a, the patient had listhetic C5–C6 segment without spinal cord compression or myelomalacia. On dynamic X-ray and CT scan [Figure 2]b, there was demonstrable spontaneous interbody fusion at C5–C6. On dynamic X-ray, there was no demonstrable instability or dynamic compression of the spinal cord [Figure 2]c. The patient had significant improvement in neck function [Figure 2]d as well as VAS and neck disability index scores. Traumatic bifacetal fracture–dislocation of the cervical spine is a devastating injury, often resulting in quadriplegia. Unfortunately, it is often missed and diagnosis is delayed leading to neurological worsening. Early management of these is critical for successful treatment and favorable outcome. Delayed presentation is uncommon and especially seen in economically challenged countries. Guidelines for the management of neglected/delayed cases are unclear. Basu et al. presented a case series of neglected subaxial fracture–dislocations and presented an algorithm with successful treatment. They concluded that preoperative traction given initially aids in reduction and obviates the need for extensive surgery. If closed reduction was achieved, then anterior fusion is the treatment of choice. If closed reduction is not successful, then posterior facetectomy followed by anterior fusion should be done. Srivastava et al. presented their case series and literature review on the management of neglected fracture–dislocations. Their conclusions were largely similar to that of Basu et al. They further concluded that if reduction is achieved with soft tissue release and interlaminar decompression in attempt to reduce in posterior surgery, then facetectomy is not required. Further, if there is no preoperative neurodeficit, we can obviate need of anterior fusion after successful posterior reduction. Although above authors highlight the importance of reduction and type of approach in neglected fracture–dislocations of subaxial cervical spine, our cases give a different perspective in the management of these complicated injuries. Whenever a case of neglected fracture–dislocation of subaxial cervical spine presents in the clinic, the important factors that decide about further line of management are the extent of neurological injury and the instability at the level of injury. However, another factor that also creates a dilemma in the mind of a treating physician is the fate of the kyphosis till fusion occurs at the injured level and potential risk of spinal cord injury in this due course of time. In our cases, the patient did not have any neurodeficit and CT scan demonstrated fusion at dislocated level; recent imaging did not show spinal cord changes at the level of fused segment at longer follow-up. Hence, we prescribed conservative treatment. Once fusion is documented at the involved segemnt, deformity is non progressive and thus theoretically there is no chance of developing late onset neurological symptoms. Our cases can be labeled as one-off cases, but it opens the debate of conservative management in such scenarios. Neglected fracture–dislocation of subaxial cervical spine is encountered in busy spine practice. Treatment is challenging for favorable outcome. If autostabilization is seen, then conservative treatment can be given obviation need for extensive surgery. There is no neurological worsening at subsequent follow-ups. Srivastava SK, Aggarwal RA, Bhosale SK, Nemade PS. Neglected dislocation in sub-axial cervical spine: Case series and a suggested treatment protocol. J Craniovertebr Junction Spine 2016;7:140-5. Beutler WJ, Fredrickson BE, Murtland A, Sweeney CA, Grant WD, Baker D. The natural history of spondylolysis and spondylolisthesis: 45-year follow-up evaluation. Spine (Phila Pa 1976) 2003;28:1027-35. Prabhat V, Boruah T, Lal H, Kumar R, Dagar A, Sahu H. Management of post-traumatic neglected cervical facet dislocation. J Clin Orthop Trauma 2017;8:125-30. Basu S, Malik FH, Ghosh JD, Tikoo A. Delayed presentation of cervical facet dislocations. J Orthop Surg (Hong Kong) 2011;19:331-5.